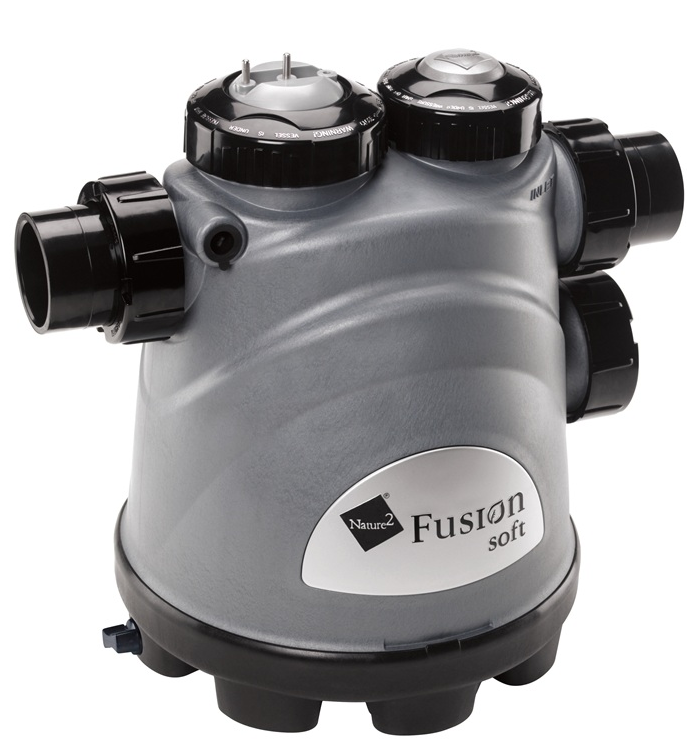 The Nature2 Fusion soft system is an all-in-one salt water sanitizer and mineral system for in-ground pools. The Nature2 Fusion soft system brings you the benefits of Nature2 minerals with the convenience and benefits of an automatic salt water sanitizer. It is proven to destroy bacteria and control algae without any of the harsh effects of traditional chemicals. No other system is this complete or easy to install, use, and maintain. With Nature2 Fusion Soft, you are just a few simple steps away from perfect pool water, naturally. Minerals, such as silver and copper, have long been known for their sanitizing antimicrobial properties. Nature2 brings the benefits of these safe elemental ingredients to create pool water that is noticeably cleaner, clearer, and softer. The idea that there is no chlorine in a saltwater pool is a misconception. You still have a chlorine pool. The chlorine is just being made from the salt in the water through electrolysis. Also anybody can convert to salt, it has nothing to do with your pump or filter system. Weather you have an indoor, outdoor, above ground, in-ground, vinyl, plaster, fiberglass......all can be converted to salt. Electrolysis is the key to saltwater pool systems. Electrolysis is a process by which bonded elements in a liquid solution are separated by passing through two charged electrodes or plates. The positively charged ions move toward the negatively charged plate (cathode), and the negatively charged ions move toward the positively charged plate (anode). Salt is made up of sodium and chloride. When saline water passes through the charged plates in the salt cell, the chlorine, which is positively charged, separates from the sodium and is released into the pool water as free chlorine. The most obvious component of a saltwater pool system is salt. The salt is dissolved into the pool water at a concentration of 3,500 ppm, roughly one-third the salinity of human tears and with one-twelfth the salt content of ocean water. In the salt cell, the saline water passes between charged plates, and by the process of electrolysis, chlorine gas is released. The control mechanism determines how many hours the salt cell runs each day. You set the control based on testing of your pool water. It is only while the salt cell runs that chlorine is being produced. There are several health benefits to saline pool systems. With a salt water pool, there is almost no transporting or handling of large quantities of chlorine tablets and shock. The free chlorine the system produces is considered less caustic than the combinations of chemicals used in a traditional chlorine pool. Additionally, the saline system prevents the formation of chloramines and other harmful chlorine compounds.Though there is an initial investment when switching to or building a saltwater pool, there are also significant maintenance savings. Because the salt in the system is recycled, it is only necessary to "top off" the salt occasionally. Saline system owners spend an average of $10 to $20 in salt each year to replace salt.Another benefit is comfort. Because a saline pool does not use the additional chemicals needed in a traditional chlorine pool, the water is less irritating to eyes and respiratory systems. Consistent maintenance is essential to the performance of a saltwater pool. Read and follow the manufacturer's directions for your saline pool, including regular cleaning and checking of chlorine and water balance.When researching a pool, be sure to consider the cost of electricity to run the salt cell the necessary hours each day. Additionally, consider the effects of saline water on plants surrounding the pool and design your landscape accordingly. 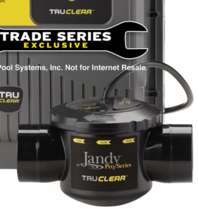 The Jandy Pro Series new TruClear is a extremely reliable saltwater chlorinator designed for easy installation, use and service. Features include durable Jandy Never Lube Valve construction, a compact design for easy integration in most equipment pad configurations, and a transparent window for quick visual inspection of blades. The energy-efficient TruClear also works at extremely low-flow rates making it fully compatible with variable-speed pumps. Our heavy-duty, electronic purifying system that uses ordinary salt to produce chlorine for pools. AquaPure includes an automatic self-cleaning feature, which ensures consistent operation and extends the life of the cell. 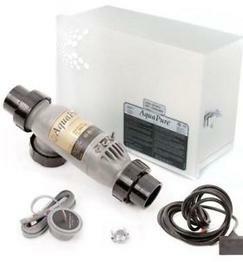 AquaPure power packs and cells are sold separately.